Hehe, it has a way of sneaking up on you doesn't it? When you want to make fresh and tasty holiday cookies you have to do all that work in the midst of the holiday craziness but there is a simple trick for doing a lot of your decorating well in advance by using royal icing transfers. 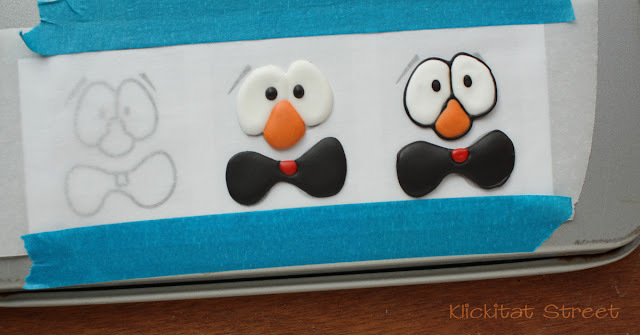 Icing transfers are made using the same royal icing you decorate cookies with except you pipe and fill on wax paper or parchment paper and then let them dry. 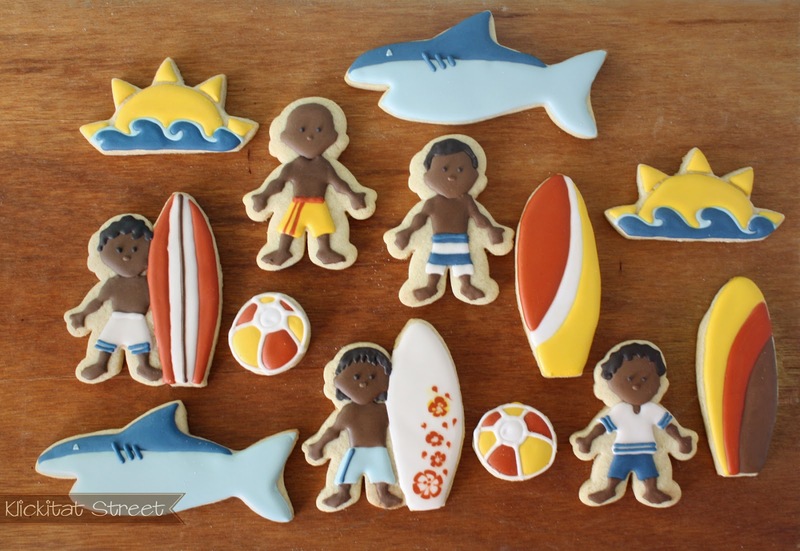 The dried transfers will keep for a long time and you can make your cookies fresh when you want them and decorate them in a flash with your pre-made icing decorations. Icing transfers are also a much less stressful way of decorating because there is really more tracing then drawing involved and you don't have to hold your breath and pipe directly on your cookies. Plus, sometimes pesky little air bubbles and craters mess up your work, but they don't seem to be as big of a problem when making transfers. 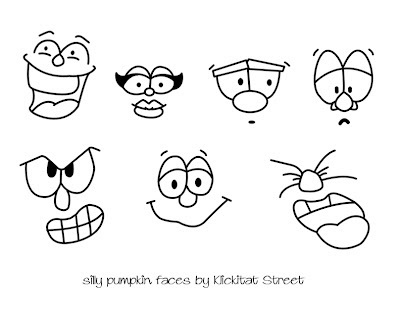 To get started you will need drawings or clip art of funny faces for your pumpkins. 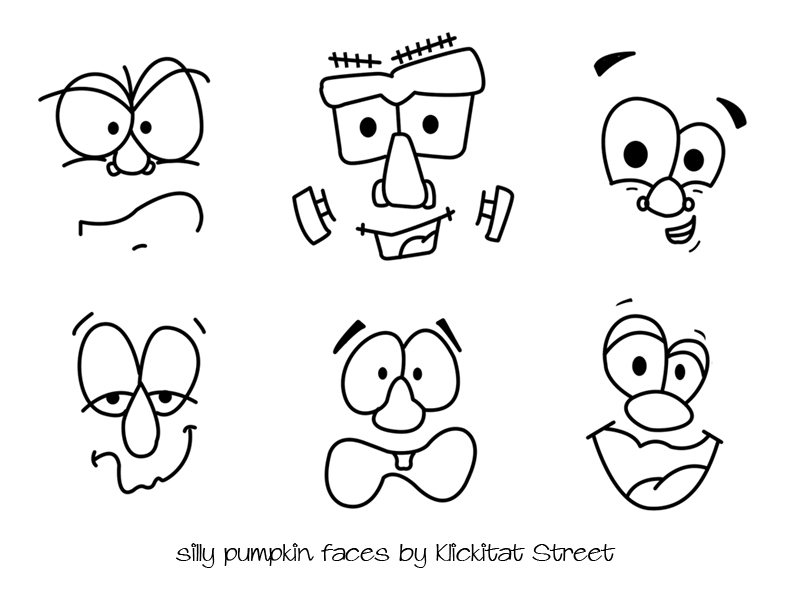 Stickers are a good source of pumpkin faces too. 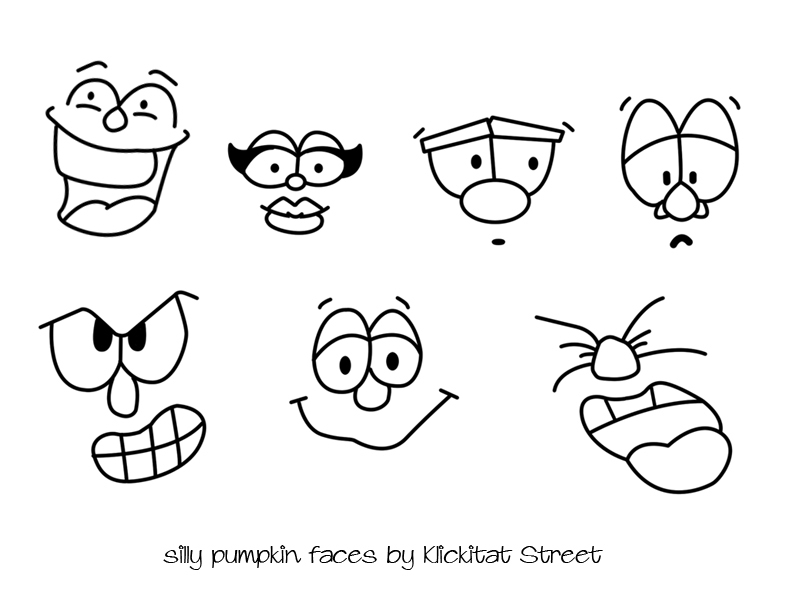 Or you can use the faces I drew, I won't mind! Click on the images to view and save them at full size. I used the Wilton comfort-grip pumpkin cutter for my cookies and the drawings should print at the right size for that cutter. Tape your drawing down to a cookie sheet or a smooth board under a piece of parchment paper. You will easily be able to see your design through the paper and then it's just a matter of filling in each section. You can either outline all in black and then fill everything in or do a section at a time letting them dry a bit in between. Using the black outline is a little faster but I prefer to work without the outline. I like the texture and dimension of the puffy icing and I also worry about bleeding issues with the black icing. 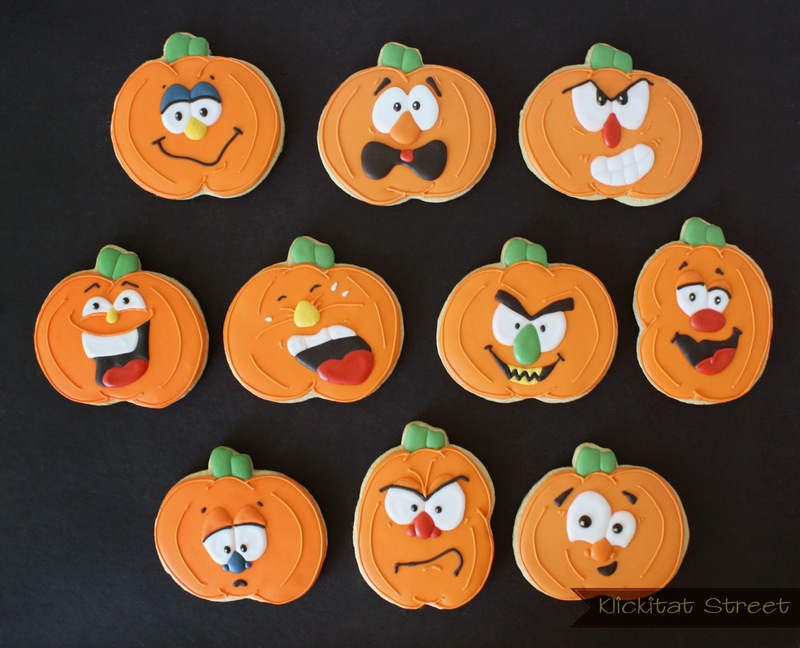 Whichever approach you choose allow the transfers to dry for a couple of days and then "glue" them to the cookie with small dots of icing. The transfers will keep for a long, long time so if you are going to wait to use them be sure to put them away in a safe dry place and make extras in case any crack. It is the small finishing details that really make cookies like this come to life. 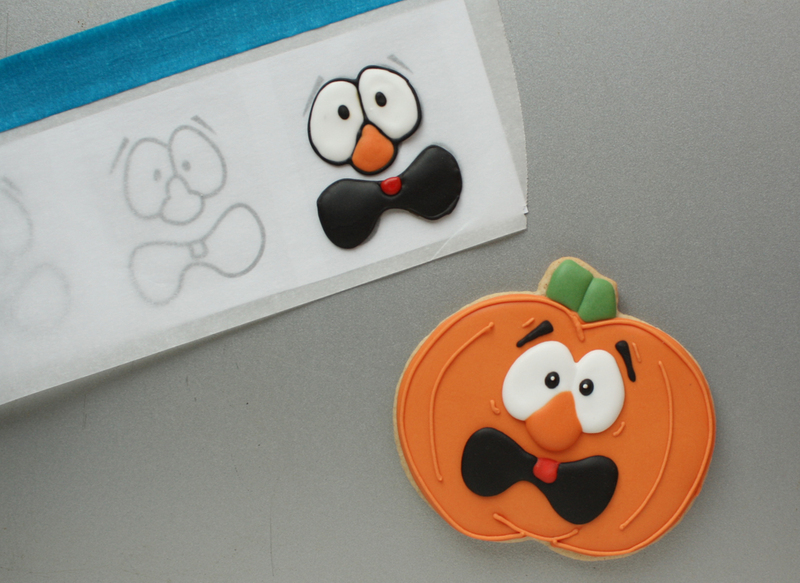 Add the thin details like eyebrows and expression lines directly to the cookie. And don't forget little whites in the pupils of the eyes! It makes a huge difference. 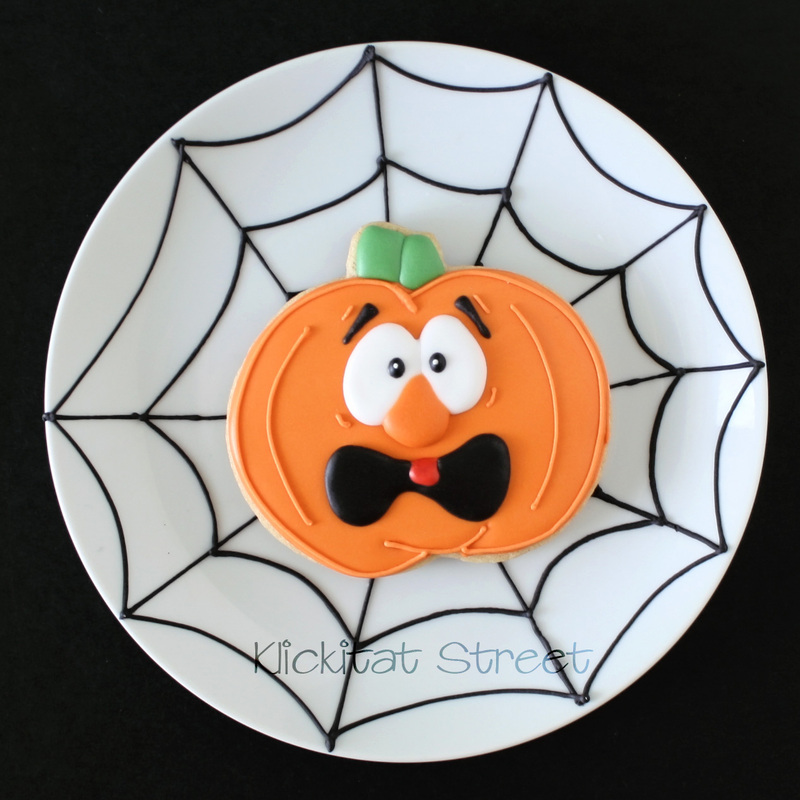 Of course you aren't confined to just orange pumpkins! And now for something REALLY cool! A few weeks ago the fantastic Callye of Sweet Sugar Belle approached some cookie friends with a challenge of doing something creative with a basic pumpkin cookie cutter. 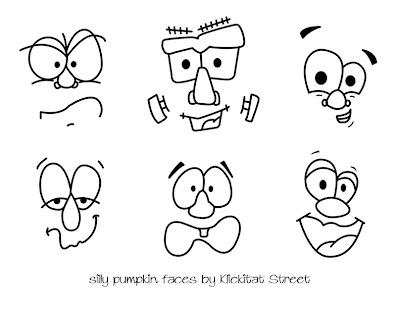 The faces I made are just one of over 20 more pumpkin projects! Be sure to visit all the blogs to see these awesome projects up close! Here in the Pacific Northwest fall is ALMOST in the air. We've been gifted with an unseasonably warm spell before the rainy season starts up again but I know it will be here in a flash. I'm so excited that the holiday cookie season is right around the corner but first I have I get in one last nod to summer! 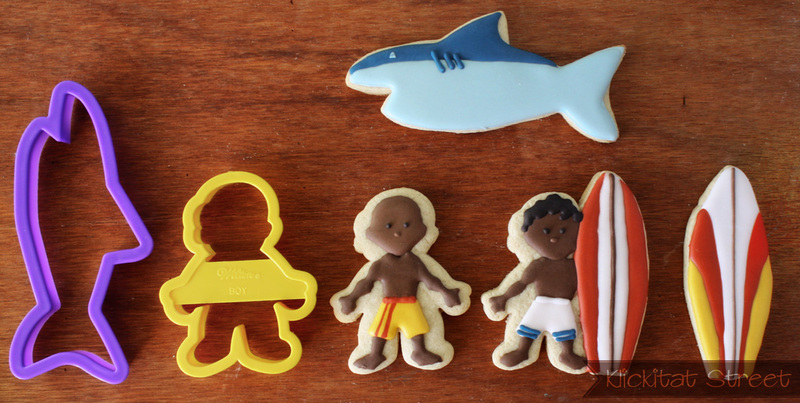 When I'm planning a cookie set I like to use the same cutter for different cookies if I can. I think it helps pull the design together when you repeat the shapes. For this set I used a shark from the Wilton Animal Cookie Cutters to cut the shark cookies and also to cut the surfboards by trimming the fins and the tail from the shark. 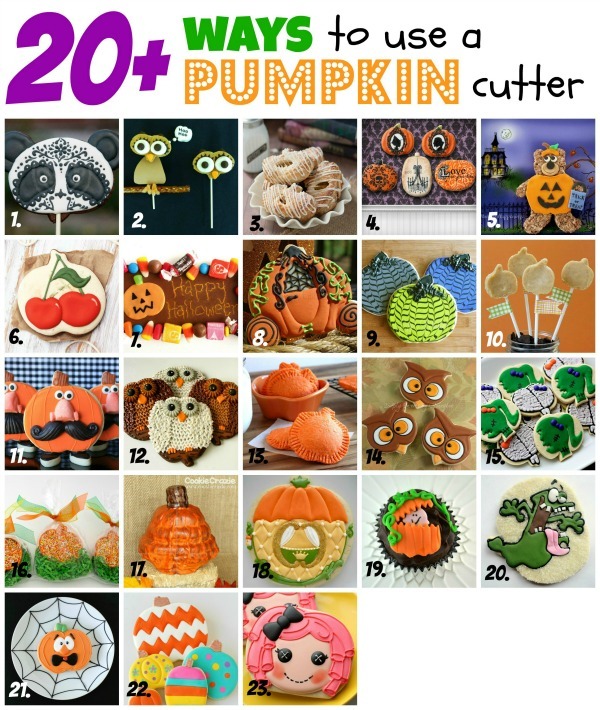 I could have made the entire platter from just these two cutters! 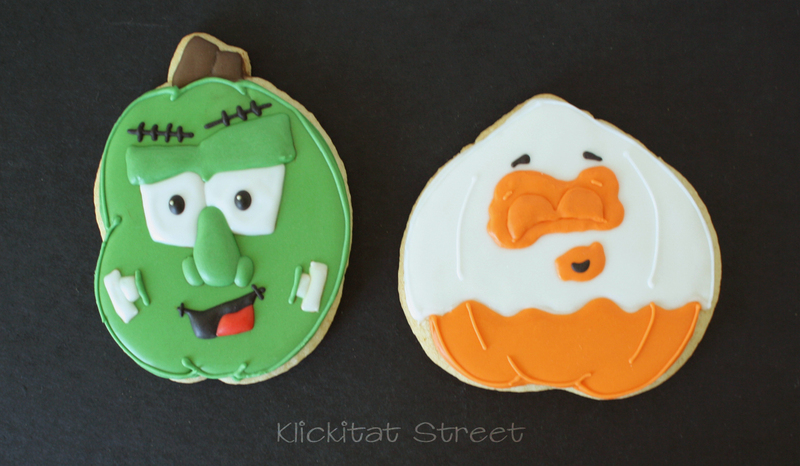 I also wanted the cookies to have a feel of summer and fall so I used colors from both to bridge the seasons. The blues and yellow are for summer and then yellow again with orange and brown for fall. I plan on doing several posts about choosing and mixing icing colors very soon but for now I'm just relaxing with the last of the sunny days! 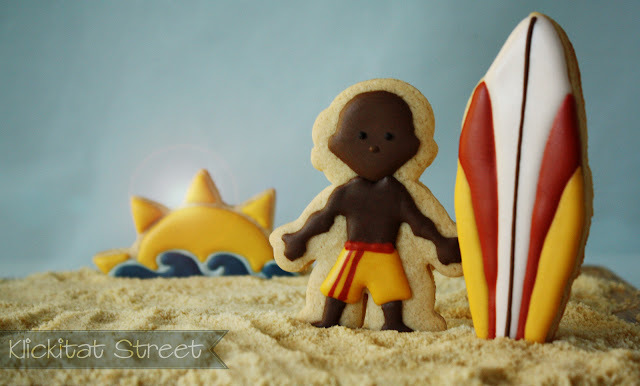 I hope you are enjoying the last days of your summer!